Here you can find different examples how to use our virtual printer technology in your applications. We illustrate the examples with code in C++. The INI file may passed to your application through command line, named pipe or WM_COPYDATA message, for more details see the documentation. Pre-converter is an application that Virtual Printer Driver calls before EMF files conversion. Using pre-converter you are able to process the EMF files as necessary and change some Virtual Printer Driver settings such as output formats, watermarks, output directory and others except device settings (paper size, resolution, orientation, etc.). All these settings are stored in Registry. For more Information, see the documentation. 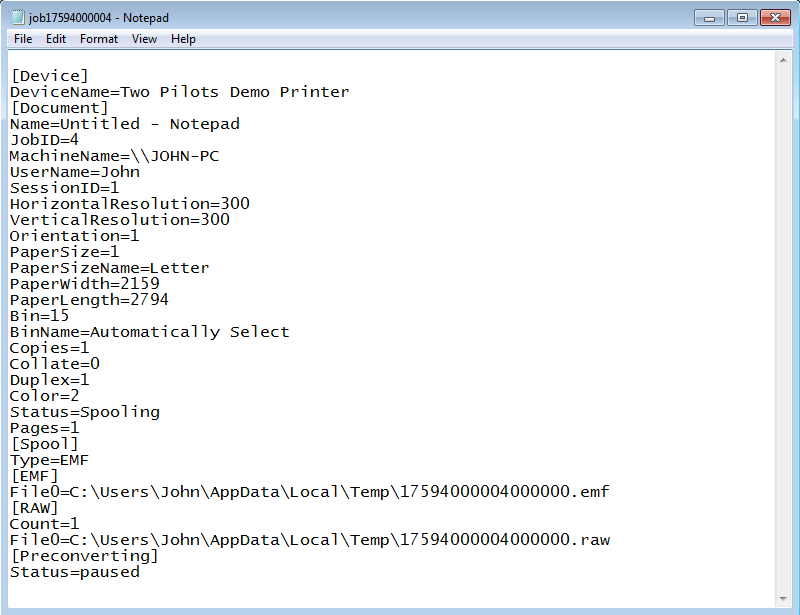 Virtual Printer Driver calls the pre-converter passing the path to the INI file with the print job properties. According to your needs, you can configure Virtual Printer Driver to send the INI file path to the pre-converter through the command line, named pipe or WM_COPYDATA message. Virtual Printer Driver receives the print job, extracts the EMF files, pauses its processes, calls the pre-converter and does not resume until the pre-converter either updates the print job status or simply closes. The INI file provides the paths to all the EMF files in [EMF] section of the file and the print job status in [Preconverting] section. After the EMF files are processed and the Virtual Printer Driver is set up, the pre-converter should update the print job status in the INI file. Note that right after the pre-converter updates the INI file, Virtual Printer Driver resumes its processes. So if the pre-converter updates the status before EMF processing, Virtual Printer Driver will probably use them in their initial state as the pre-converter does not have time to change them. 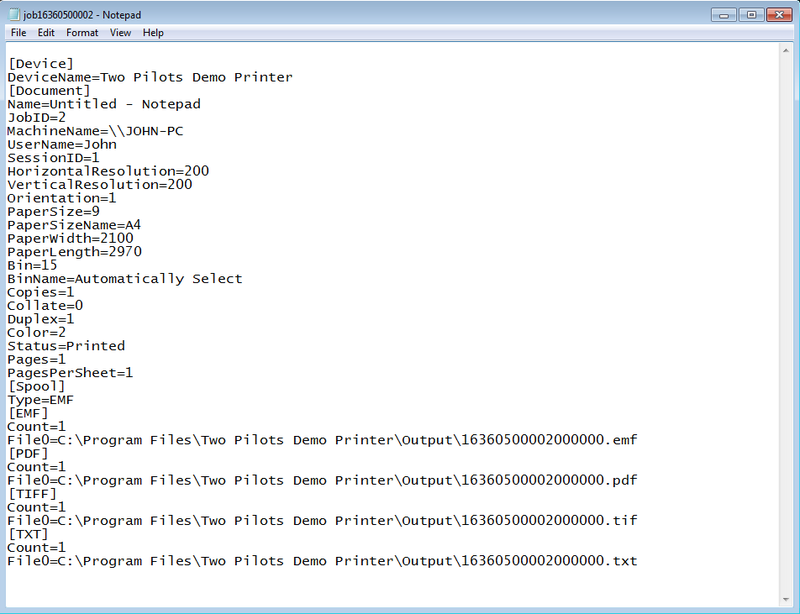 Set up the pre-converter for Virtual Printer Driver according to the Application Settings section. Let’s create a simple console pre-converter application that receives the path to the INI file through the command line and decides to continue conversion process if “HorizontalResolution” and “VerticalResolution” are less than or equal to 300 and paper size is less than or equal to 2286 x 3048 in tens of mm (9” x 12”). The example source Code and Visual Studio 2013 solution are available here. We should set the pre-converter settings for Virtual Printer Driver. 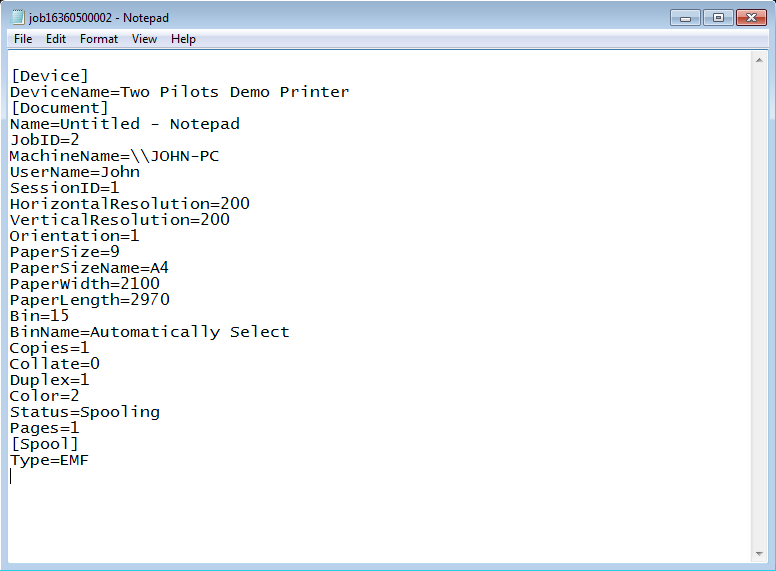 Open Registry and locate the key “HKCU/Software/Two Pilots Demo Printer/Application”. In that key, create “Preconverter” key. Enabled REG_DWORD Enables or disables the pre-converter. To enable set value to “1”. Transfer mode REG_DWORD The way the pre-converter receives the INI file path. Set “0” to receive through the command line. After that we can use our pre-converter. Post-converter is an application that Virtual Printer Driver calls after EMF files conversion. Using post-converter application you are able to process the result files as necessary. 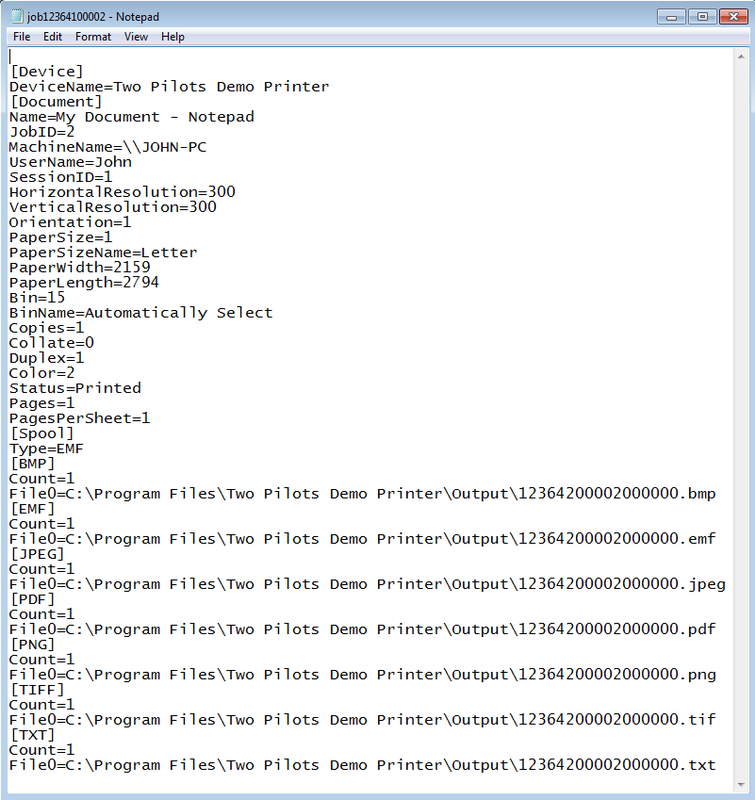 Virtual Printer Driver calls the post-converter passing the path to INI file with the print job properties and paths to result files. According to your needs, you can configure Virtual Printer Driver to send the INI file path to the post-converter through the command line, named pipe or WM_COPYDATA message. Virtual Printer Driver receives the print job, extracts the EMF files, process EMF files and calls the post-converter. The INI file provides the paths to all the EMF, BMP, JPEG, TIFF, PNG, PDF and Text files in the corresponding sections. Set up the post-converter for Virtual Printer Driver according to the Application Settings section of the Documentation. Let’s create a simple console post-converter application, which called default viewer on PNG files. The example source code and Visual Studio 2013 solution available here. We should set the post-converter settings for Virtual Printer Driver. In that key, create “Postconverter” key. Enabled REG_DWORD Enables or disables the post-converter. To enable set value to “1”. Transfer mode REG_DWORD The way the post-converter receives the INI file path. Set “0” to receive through the command line. After that we can use our post-converter. Early-access is a Virtual Printer Driver mode that allows receiving paths to converted files during the conversion process. Virtual Printer Driver receives the print job, calls the post-converter passing path to INI file with the print job properties. The INI file provides the print job status in [Document] section. At this step it set to “Spooling”. The paths to result files are packed into a package. Each package stores device name, print job ID and paths to result files with zero ('\0') as delimiter and double zero at the end of the package. comes from device “Two Pilots Demo Printer”, job ID is 17 and there are two files “c:\Output\result.emf” and “c:\Output\result.png”. The print job status in [Document] section is set to “Printed”. Let’s create a Win32 application, which receive data through WM_COPYDATA message and shows BMP file in the default viewer. Code sample below shows WM_COPYDATA handling in a dialog procedure. // package is an array of strings "value0\0value1\0value2\0…\0\0"
// paths to converted files received in format "printer name\0job id\0file0\0file1\0…\0\0"
package += wcslen(package) + 1; // skip header "printer name\0"
package += wcslen(package) + 1; // skip header "job id\0"
Transfer mode REG_DWORD The way the post-converter receives the INI file path. Set “1” to receive through WM_COPYDATA message. Early Access REG_DWORD Enables or disables the Early-Access mode. To enable set value to “1”. Window title REG_SZ Title of the component application window. For example, ClientAppTitle. After that we can use our post-converter in Early-Access mode. In this sample we use VPD SDK API which is distributed as part of Devkit package, you can download it here. if hive contain both of HKLM and HKCU hives then get-method will reads settings from HKCU hive first. registryKey is a root key for Virtual Printer Driver settings in the selected hive, for example, “Software\\Two Pilots Demo Printer” mean “HKCU\Software\Two Pilots Demo Printer” or “HKLM\Software\Two Pilots Demo Printer”.